Update from Pancho`s foster mom 10/17/11. I am trying lots of new foods with my new foster mother and even eating a variety of pellets. I love foot toys and shreading toys. I balance good on my foot with one toy so I can use my other foot to tear into my food and toys with gusto. I am a sweet too because I am just a baby. I play for long periods of time on my own which is good behavior I`m told. I would love to learn more foraging games. Maybe you can adopt me and teach me hide and seek with foraging toys." It`s me again...Pancho. Boy do I feel good now! My foot is healed and I can get around just fine. I am learning to balance and I can climb around my cage. The flat perches my foster mom gave me really do the trick. Just a 2X4 is all I need and I`m good to go...plus they`re real fun to chew. Now that I`m all better, maybe you could give this big beautiful sweet guy a home. Pancho here. I`ve always been a happy bird but I`ve recently undergone a traumatic event. I was playing with a toy in my cage when some string hanging from it got wrapped around my toes. The circulation was cut off for so long that I actually chewed two of my own toes off to break free! It`s not certain what happened after that because no one was home to check on me. Once I was found my family rushed me to an avian vet and that`s when they learned some of my toes would have to be amputated. Unfortunately, they couldn`t afford to pay the vet bills and that`s when they called Mickaboo. While my family was really upset at having to give me up, they knew it was what was best for me. I`m now in a foster home getting the medical care that I need. My left foot is fine and I still have the back two toes on my right foot. I`m not disabled, I`m simply adapting to a new way of getting around, so once my foot is in better shape I can be adopted. My foster mom reports that I`ve been a trooper from the start! 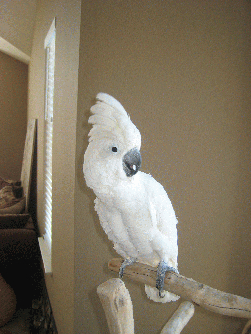 I`m a very sweet bird - I came from a loving home and have never known anything different. Hopefully I recover quickly so we can get acquainted. I`m anxious to have a home again!